How do you design and operate a healthy building? Answers to these questions can be found in an increasing number of methodologies and rating schemes that have seen the light around the world in recent years. They all share the ambition to strengthen the health and well-being of building users. Yet, they vary widely in terms of their overall scope, the metrics they use as proof of performance, and the weight that they put on the different phases in a building’s life cycle. The following chronological overview presents a selection of the most important and forward-looking tools, as well as their underlying methodologies. This overview shows the seven planning tools and their respective structures at a glance. Most of the tools pursue a holistic strategy that encompasses energy and other environmental issues as well as indoor climate. Life cycle costing also plays a role in the DGNB and AktivPlus systems. 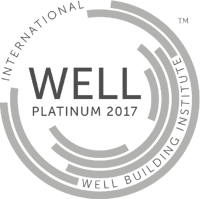 The WELL Building Standard focuses only on aspects of health and well-being. Most schemes offer several levels of certification (such as Silver, Gold and Platinum) whereas others, such as Active House or AktivPlus, place a stronger emphasis on planning guidance. In the future, BRE intends to further develop the certification scheme to include quality of life issues such as views, landscape, connections to nature (through biophilic design) and biological rhythms (through circadian lighting). Another aspect to be included concerns indoor and outdoor environments that encourage healthier lifestyles. Recently, BRE also engaged in a collaboration with the International WELL Building institute to better align the BREEAM and WELL standards. New and refurbished residential and non-residential buildings as well as commercial buildings in use, communities and infrastructure. Projects that do not fall within these categories may be certified according to a custom-tailored scheme (BREEAM Bespoke). BREEAM measures sustainable value in up to ten categories depending on the project type. These are each sub-divided into a range of assessment issues or criteria, each with its own target and benchmarks. The latest version of BREEAM New Construction comprises a total of 49 individual assessment issues. Compliance with these is verified by a third-party BREEAM assessor. To ensure healthy indoor air, BREEAM requires design teams to set up an indoor air quality plan that contains strategies for the removal and control of contaminant sources, procedures for pre-occupancy flush out, third-party testing and maintaining good indoor air quality in-use. Projects are awarded additional credits if they fulfil requirements regarding the overall ventilation strategy, user control of the fresh air supply, emissions from building products and post-construction measurement of the indoor air quality. Key aspects of the ventilation concept are the air exchange rate and the placement of air inlets or windows, which should be away from external pollutant sources. The use of CO2 sensors is recommended in spaces with large and unpredictable occupancy patterns. For interior paints and coatings, flooring materials, wood-based products and insulation materials, BREEAM specifies the maximum formaldehyde and total VOC content, as well as specific testing procedures. Additional credits are awarded for formaldehyde and VOC measurements carried out in the finished building before the users move in. Two alternative options can be used within BREEAM New Construction to quantitatively assess the daylight provision. Either the project team ensures that a specific proportion of each type of space (usually 80%) achieves an average daylight factor of 2%. In addition, BREEAM stipulates that a specific uniformity in the daylight distribution be achieved in this case. Alternatively, a dynamic daylight simulation can be carried out. In this case, the relevant metric is the area that achieves a given natural illuminance (usually at least 300 lux) for a specific number of hours per year. Adequate glare control, according to BREEAM, can be provided by both building integrated measures, such as overhangs or fins, or by specific types of moveable shading devices. Design studies are recommended to verify that these eliminate glare to a sufficient degree, both in summer and winter. To assess the quality of views, BREEAM uses the room depth and wall-to-window ratio as criteria. As a rule, permanently occupied spaces should be at most 8 m (in residential buildings, 5 m) from a facade, and the window-to-wall ratio should be at least 20%. In its Management category, BREEAM New Construction specifies best-practice procedures for the commissioning and handover of buildings, as well as the verification of their performance. For handover, BREEAM recommends two different guidebooks and two different training schedules to be set up – one for facilities management and one for less technically adept building users. An additional credit is awarded if a post-occupancy evaluation (POE) is carried out one year after users move in. In the operation phase, the BREEAM In-Use scheme can be used to improve the performance of the building and the quality of the building management. In the field of health and well-being, the evaluation is largely based on qualitative parameters such as the degree of control that the users have over temperature, glare, illumination levels and air supply. Quantitative measurements are only specified for illuminance levels achieved indoors. How do you assess the quality of views out of windows? In its “Quality Views” credit, LEED provides a tentative answer: a project can gain points if 75% of all regularly occupied floor area achieves a direct line of sight to the outdoors through clear glazing. Further criteria for a good view, according to LEED, include lines of sight pointing in two different directions, as well as views of fauna, flora, sky, movement and distant objects placed at least 7.5 metres away from the building. Currently, LEED comprises 21 different rating systems that apply to different types of projects. These include new buildings (ten rating systems), new interiors (three rating systems), the operation and maintenance of existing buildings (six rating systems) and neighbourhoods (two rating systems). LEED BD+C New Construction is made up of 8 categories with a total of 12 prerequisites and 46 credits. While prerequisites are mandatory to meet certification requirements, the credits offer project teams a choice of where to put the focus in the optimisation of their building or neighbourhood. As a prerequisite, LEED stipulates air exchange rates compliant with either the ASHRAE 62.1-2010 or the EN 15251/EN13779 standards. For manually ventilated spaces, measurement devices that measure the exhaust airflow and CO2 concentrations in indoor spaces must be supplied. In residential buildings, carbon monoxide monitors in each dwelling unit are also mandatory, and indoor fireplaces and wood stoves must have solid enclosures or firmly sealing doors. Additional credits are available if the ventilation rate exceeds the minimum requirement by at least 30% or, in the case of natural ventilation, if a room-by-room calculation of the ventilation rate has been carried out. Points can also be gained by specifying low-VOC materials for furniture and interior fit-outs. These should have been tested against the Californian CDPH Standard Method v1.1- 2010 or against the German AgBB scheme. To optimise daylight conditions in a LEED-certified building, project teams can either perform a dynamic computer simulation or carry out on-site measurements. 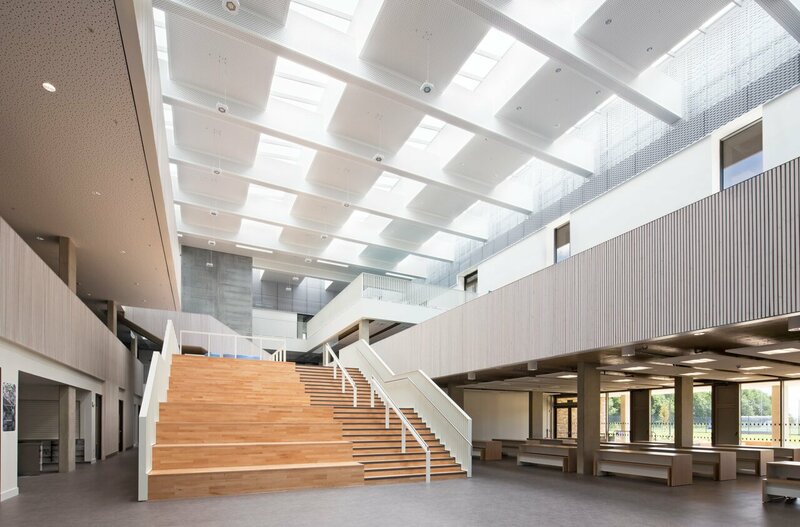 In both cases, the certification schemes specify lower limits (to ensure sufficient daylight provision) as well as upper limits (to prevent excessive glare) for daylighting levels. In simulations, two different sets of metrics can be used: either the spatial daylight autonomy (sDA300/50%), in combination with the annual sunlight exposure (ASE1000,250), or daylight illuminance levels (which have to be between 300 and 3000 lux for a given proportion of the regularly occupied floor area). In measurements, only the natural illuminance is used as the relevant metric. 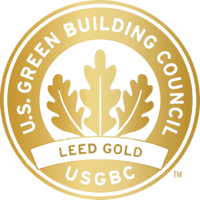 In order to improve air quality, LEED for New Construction (LEED-NC) stipulates a smoking ban both inside buildings and outdoors − except in designated outdoor smoking areas. Further credits reward building owners for carrying out an indoor air quality assessment after construction and before occupancy, but under ventilation conditions typical for occupancy. This includes measurements of formaldehyde, particulates, ozone, VOCs and carbon monoxide, as well as a number of other potentially harmful chemicals. Alternatively, building owners can choose to ‘flush out’ the building with large volumes of air just before users move in. LEED for Operation & Maintenance (LEED O&M) specifies further measures that building owners can carry out during occupancy, such as: measurements of the actual air exchange rates, a permanent monitoring of thermal comfort parameters, and an occupant comfort survey carried out every two years with at least 30% of the building’s occupants. If more than 20% of all respondents are unhappy with the building, corrective action needs to be taken. To ensure healthy indoor air quality during occupancy, LEED recommends establishing a green cleaning policy that comprises both the tools and chemicals used for cleaning, as well as the cleaning process and implementing an indoor air quality management programme based on the I-BEAM model developed by the U. S. Environmental Protection Agency (EPA). The Living Building Challenge sets stringent requirements particularly in terms of water, energy and waste, where buildings are required to achieve a net zero or net positive balance. The requirements in terms of place, health & happiness, equity and beauty are somewhat less difficult to achieve. New buildings, renovations, landscape and infrastructure projects. 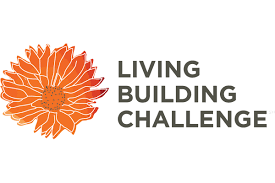 The Living Building Challenge consists of seven performance categories, or ‘petals’. These are in turn subdivided into a total of 20 Imperatives, each of which focuses on a specific sphere of influence. All 20 Imperatives are required for new buildings, 16 for renovations, and 17 for landscape and infrastructure projects. Two core rules apply in the Living Building Challenge: firstly, all Imperatives are mandatory. Secondly, Living Building Challenge certification is based on actual, rather than anticipated, performance. Therefore, projects must be operational for at least one year prior to evaluation in order to verify compliance. The Living Building Challenge requires all regularly occupied spaces to have operable windows that let in daylight and fresh air. Furthermore, Living Buildings must achieve ventilation rates compliant with the ASHRAE 62 standard. Only materials and products that have been tested for VOC emissions may be installed in interior spaces. A ‘red list’ bans, among others, bisphenol A (BPA), cadmium, chloroprene, added formaldehydes, halogenated flame retardants, phthalates and PVC from the building materials. Kitchens, bathrooms and janitorial areas are to be equipped with dedicated exhaust systems. Daylight is addressed qualitatively, rather than quantitatively, in the Living Building Challenge. This is done through the requirement for operable windows and through the ‘Biophilic Environment’ imperative. The latter requires project teams to set up a biophilic framework and plan for the project that includes the incorporation of environmental features, natural light and natural shapes. Beauty and the connection to the natural environment are key issues in the Living Building Challenge. Amongst other things, the biophilic plan has to ensure that the building provides sufficient and frequent human-nature interactions, both in the interior and exterior spaces. Projects have to be operational for at least twelve consecutive months before a certification is possible. 12 of the 20 imperatives can be verified after construction through a preliminary audit. In the other eight imperatives, which include Health & Happiness, performance is verified after the first year of operation and based on quantitative data. Both before the users move in and nine months after full occupancy, the indoor air quality is tested for particulate matter, VOCs, formaldehyde and other common pollutants. Basic comfort parameters such as temperature, humidity and CO2 levels are also permanently monitored. Smoking is banned from all Living Buildings and the building management has to set up a cleaning protocol that uses cleaning products compliant with the EPA Design for the Environment label. In-use monitoring even extends to the ‘Beauty & Inspiration’ petal: in the first year of occupancy, a survey of at least 10% of the building users is carried out to evaluate whether the project lives up to the claims of the designers in terms of beauty. First launched in a pilot phase in 2008, the DGNB system is a relative newcomer among the comprehensive building rating systems. Its criteria were initially developed by the German Sustainable Building Council together with the German Ministry of Construction. Meanwhile, the two institutions each pursue their own further development of the system; DGNB is also being applied internationally. New construction, existing buildings and urban districts. Within these fields, a total of 22 different schemes are currently available for specific types of buildings and districts. Amongst other things, DGNB has separate schemes for existing buildings, refurbished buildings and the management of existing buildings. All schemes in the DGNB system are based on a uniform evaluation method that is then adjusted to match individual types of buildings or different requirements. The scheme most frequently used is ‘New Construction Offices’, which currently encompasses 37 assessment criteria grouped into six categories. To prevent contamination of the indoor air in the first place, all relevant elements and materials in the building are assessed against a matrix of indicators. This contains limits and target values for substances such as VOCs, solvents, flame retardants, plasticisers, heavy metals and other potentially harmful substances. Beyond maximum permissible limits for each product category, buildings can gain additional points if materials contain fewer pollutants or have been awarded more ambitious environmental product labels. Additionally, DGNB uses three key indicators to assess indoor air quality: the total VOC and the formaldehyde content, as well as the ventilation rate. While VOCs and formaldehyde are measured shortly after building completion, the approach used to determine the ventilation rate depends on the type of building and the ventilation system. For residential buildings, DGNB stipulates a ventilation concept according to DIN 1946-6. For most other buildings, design teams can choose between computational fluid dynamics, an assessment according to DIN EN 15251 for mechanical ventilation or, in the case of natural ventilation, a simplified calculation. The latter evaluates ventilation rate based on the height and depth of each space, as well as the size of operable windows. 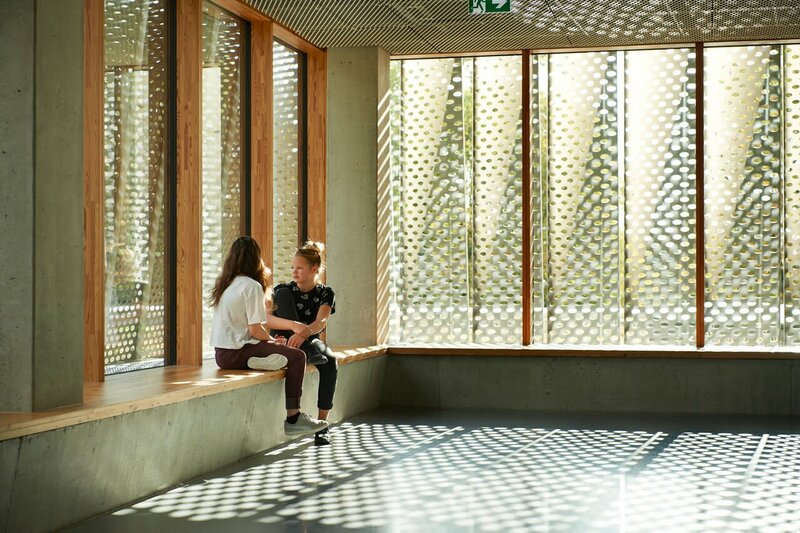 The DGNB system considers a total of six aspects in terms of daylight and visual comfort: daylight availability in the building as a whole and at the workplace, views to the outside, glare protection, the colour rendering index of the glazing and solar shading, as well as direct sunlight. In the case of daylight availability, the maximum number of points is awarded if 50% of the usable area achieves a daylight factor of at least 2%. With regard to views outside, the evaluation also takes into account whether visual contact is still possible whilst the blinds are drawn. Glare protection is only assessed for non-residential buildings, whereas direct sunlight is only taken into account for residential buildings and hotels. DGNB recognises the fact that the more people can directly influence their environment the more likely they will be satisfied with it. In its ‘User control’ criterion, the system, therefore, rewards designers and building owners if the air exchange, shading systems and temperature can be separately regulated in each room, and directly influenced by the users. In residential buildings, the highest rating is given to buildings with a demand-controlled ventilation system (e. g. via CO2 sensors) that the residents can overrule if they wish to. The DGNB schemes for new buildings stipulate a VOC and formaldehyde test of the indoor air only after completion of the building before the users move in. Further requirements are specified in a newly introduced scheme for office and shop interiors. Here, owners are awarded extra points for continuous monitoring of CO2, particulate matter and ozone levels, as well as the relative humidity of the indoor air. However, the DGNB system does not specify limits or benchmark values for any of these parameters. Instead, the DGNB scheme for the operation of existing buildings takes into account user satisfaction with the indoor environment. While no minimum requirements are set for the frequency and scope of post-occupancy evaluations, the certification result significantly depends on the extent and number of participants in such evaluations, as well as on how complaints are dealt with. Under the headline “Buildings that give more than they take”, Active House promotes the vision of healthy and comfortable living in buildings without negatively influencing the climate and environment. Active Houses seeks to provide an answer to the three main challenges facing the building industry today: comfort, energy and environment. The Active House Specifications contain both quantitative and qualitative criteria. The quantitative parameters represent the nine most important topics for an Active House evaluation, such as indoor air quality, daylight and environmental load. Each parameter is evaluated individually and displayed in the Active House Radar diagram. The qualitative parameters represent additional concerns that should be included in the global performance assessment for an Active House. The Active House Radar is an indication of how ‘active’ the building has become. The diagram shows the level of ambition in each of the nine quantitative parameters on a scale from 1 to 4, where 1 is the highest level and 4 is the lowest. The only quantitative measure of air quality in an Active House relates to the CO2 concentration in the indoor air. This is determined using dynamic simulation tools at the design stage. To achieve level 1 in the Indoor Air Quality parameter, the ventilation of the main rooms should be designed in such a way that the CO2 concentration does not rise more than 500 ppm above the outdoor CO2 concentration. Among its qualitative parameters, Active House also recommends using materials with indoor climate labels and ensuring that there is sufficient air extraction from kitchens and bathrooms. Building users should be able to manually adjust the air change rate by opening windows, and mechanical ventilation systems should allow at least three levels of adjustment. 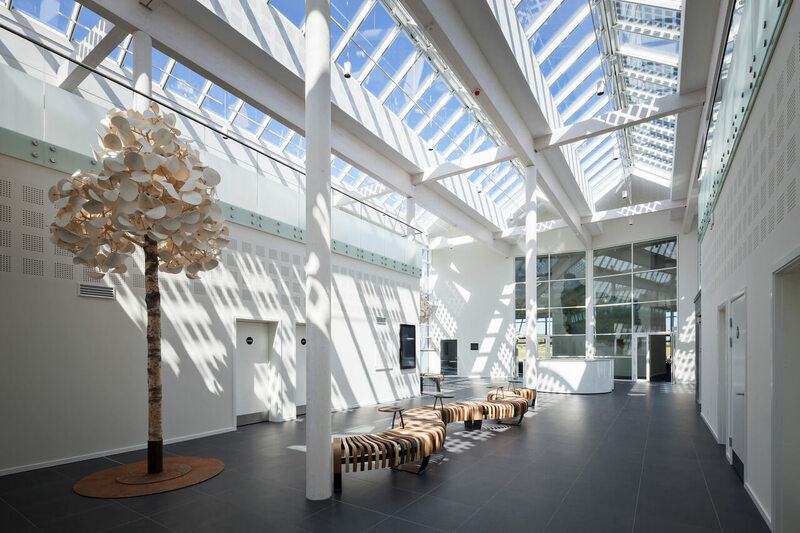 Active House takes two aspects into account when assessing the daylight quality of buildings: the daylight factor (DF) and the direct sunlight availability. To achieve level 1 in the Daylight parameter, the DF should be at least 5% on average in the main rooms of the house, and at least one of the main rooms should receive direct sunlight for at least 10% of the probable sunlight hours between autumn and spring equinox. Qualitative recommendations in terms of daylight include: locating windows for optimum views, using glazing with the highest possible light transmittance and managing glare with appropriate building-integrated measures or dedicated shading devices. Furthermore, daylight provision should also be extended to secondary rooms such as kitchens and bathrooms. To objectify the risk of overheating, a dynamic thermal simulation tool is used to determine hourly values of indoor operative temperature in each room. In dwellings without mechanical cooling systems, adaptive temperature limits are used in the summer months. This means that the maximum allowable temperature inside is linked to the weather outside: limits go up during warmer periods. In its qualitative recommendations, Active House emphasises user control over the thermal environment. Residents should be able to control heating temperatures at room level and manually counteract overheating in summer by opening windows or operating shading devices. Draught should be prevented by a suitable placement of ventilation outlets. In order to ensure that the final project meets the expected level of ambitions, Active House recommends that building owners monitor their project. The monitoring process should last for one year as minimum (ideally two) and the differences between the calculated performance and the actual performance can be visualised in the Active House Radar. Follow-up is recommended, with adjustments made when necessary. WELL is the first standard of its kind that focuses solely on the health and wellness of building occupants. The scope of WELL extends significantly beyond the building fabric as such. The scope of WELL extends beyond the building itself. The standard rewards employers for providing paid parental leave and on-site child care centres for their staff. In addition, a dedicated ‘altruism’ optimisation encourages companies to grant their staff paid time off work in order to participate in volunteer activities. New and Existing Buildings, New and Existing Interiors, and Core and Shell. Pilot programmes are available for other building types such as multifamily residences, retail, and restaurants. WELL is also designed to work harmoniously with other, more comprehensive green building rating systems such as LEED, BREEAM, and the Living Building Challenge. The initiators of the standard “encourage projects to pursue both WELL and standards that address environmental sustainability”. The WELL Building Standard is organised into seven categories of wellness called Concepts: Air, Water, Nourishment, Light, Fitness, Comfort and Mind. These are comprised of a total of 105 features. Some WELL features are categorised as preconditions that must be fulfilled for all levels of WELL certification. So-called optimisations, in contrast, are not mandatory for basic (Silver level) certification but create a flexible pathway towards higher levels of certification. WELL is largely performance-based; in most cases, specific, measurable ‘markers’ (thresholds) must be met. In other cases, particular strategies are required, as strong evidence suggests there are benefits to implementation. With 29 single features, this is by far the most comprehensive of the seven concepts in WELL. The standard sets limits for formaldehyde and VOC emissions, as well as particulate matter and radon emissions in the indoor air. VOC emissions are also tackled at source by specifying low-VOC interior paints and coatings, sealants, floorings and furniture. Operable windows or a demand-controlled ventilation system have to be installed to keep CO2 levels permanently below 800 ppm. A voluntary optimisation feature requires that the ventilation system be capable of maintaining relative humidity between 30% and 50% at all times by adding moisture to or removing it from the air. Three more optimisation features (Right to Light, Daylight Modelling and Daylighting Fenestration) also make direct reference to daylight. Among other things, they limit the distance from regularly occupied spaces to windows and set minimum requirements for the spatial daylight autonomy, as well as the window-to-wall ratio. WELL recommends a number of measures aimed to improve users’ mental health and well-being. These include designated quiet spaces and facilities for short naps in office buildings. Furthermore, design teams are encouraged to integrate design features and artwork that stimulate human delight and celebrate culture, spirit and place. In order to achieve WELL certification, the building must undergo a process that includes an on-site assessment and performance testing by a third party. Smoking is banned from all WELL-certified buildings and the use of pesticides has to be eliminated in the outdoor areas. Owners are required to set up a cleaning plan for all occupied spaces. A voluntary optimisation feature recommends that the building is ‘flushed’ with large volumes of fresh air after completion and prior to occupancy. Additional points can be gained by monitoring particulate matter, CO2 and ozone levels in the indoor air, and by displaying temperature, humidity and CO2 to building users in real time. The Mind category also comprises measures that can be applied to increase users’ satisfaction and health. Post-occupancy surveys have to be conducted annually with at least 30% of the users. Furthermore, employers are encouraged to subsidise wearable health sensors (e. g. for activity and heart rate, as well as sleep duration and quality) for the use of their employees. WELL also rewards companies for limiting late-night work, night-time business flights and the overall travel time on business trips. In contrast to almost all other rating systems, the energy and CO2 emissions of AktivPlus buildings are calculated not only per square metre but also per person. In this way, users should be able to assess the properties of the building in relation to a metric that they can understand. Furthermore, besides a focus on efficiency and the use of renewable resources, AktivPlus also recognises strategies of sufficiency and economical use of spaces with this strategy. Residential, office and educational buildings. An extension to additional uses such as commercial and industrial buildings is intended in the future. The catalogue of requirements is divided into four categories with a total of 14 criteria, six of which are quantitative and eight qualitative. Quantitative criteria must not only be fulfilled in planning, but also after the 1st and 2nd year of operation. Some of the criteria – such as CO2 emissions per capita – are not currently considered in any other standard in this form. The achievement of the AktivPlus objectives is presented in a segmented 'AktivPlus Flower' diagram. AktivPlus requires a ventilation concept that provides sufficient air exchange for every room in the building. This can be done mechanically or through facade openings and the fresh air supply should be individually adjustable by the user. In addition, AktivPlus recommends creating a concept for low-pollutant construction and using construction materials that have been tested for harmful substances (e. g. according to the AgBB test scheme). A VOC measurement should be carried out in a building ready for occupancy with floor coverings but without furniture. Adequate daylight supply must be ensured in AktivPlus buildings. A daylight simulation is recommended for all rooms that have been designed for permanent occupancy. The number of windows and skylights should be selected in such a way that an average daylight factor of at least 2% is achieved in these rooms. Natural lighting is also recommended in bathrooms and, in particular, kitchens. According to AktivPlus, residents must be able to adapt the amount of daylight to their individual needs. Optionally, AktivPlus buildings can be submitted to a design advisory board for evaluation. This jury meets once a year and evaluates, among other things, the urban integration, organisation of floor plans, facade design and material concept as well as the longevity and ease of maintenance of the building. Other aspects include the flexibility and adaptability of the spaces, as well as qualitative aspects of the daylighting concept and the views outdoors. The AktivPlus evaluation scheme consists of four main categories, or focus areas, with a total of 12 criteria. A further 2 criteria are currently under development. A special feature of AktivPlus is that a two-year monitoring programme is carried out in all 14 categories. This applies not only to the energy performance of the building but also to indoor air quality, indoor temperatures and occupants' satisfaction, which is recorded via regular user surveys. In order to ensure good indoor air quality even during operation, AktivPlus recommends automatic ventilation control via CO2 sensors or (in the case of manual ventilation) simple CO2 displays to indicate the air quality in the room. If you want to learn more about designing sustainable buildings, in accordance with environmental certification schemes, take a look at our video, featuring Susan Carruth speaking at the Active House Symposium. Alternatively, download our case study on Green Solution House to find out how indoor comfort can be defined, integrated, monitored and improved to benefit human well-being and environmental sustainability.